Cindy Friedman, Mary Ann Stewart, and Sean Garballey. 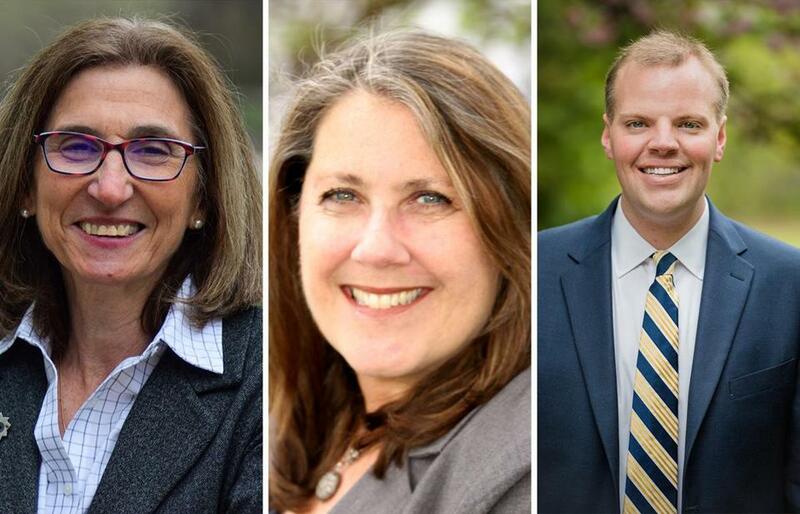 In a midsummer special election that will bring a new face to the Legislature, three Democrats in the Fourth Middlesex District are vying for a Senate seat they hope will continue the progressive legacy of Kenneth Donnelly, the state senator who died in April from brain cancer. The Democratic contenders — Cindy Friedman, who was Donnelly’s chief of staff; Representative Sean Garballey; and Mary Ann Stewart, a member of the state’s Board of Elementary and Secondary Education — will face off Tuesday in the only primary. No Republicans are running, so the primary’s winner will face off in the general election on July 25 against the Green-Rainbow Party’s candidate, Ian Jackson, a software engineer from Arlington. The candidate who wins will represent a district that includes Arlington, Billerica, Burlington, Woburn, and parts of Lexington. The candidates’ experience representing communities on a state level isn’t the only thing they have in common. All three said they want to make education more accessible and affordable across the Commonwealth. They said they want to create a structure for more convenient public transportation without increasing pressure on the state’s budget. They also want to build a more cost-effective health care system that Bay State residents can feel confident about. Many of their priorities match up, but their experiences — inside and outside of the State House — set them apart, pointing to differences they all hope voters will notice and remember come Election Day. “We have three progressive candidates that are all very similar, so I think any one of them would serve the district, and especially the people who are going to vote for them, well,” said Aimee Coolidge, who chairs the Arlington Democratic Town Committee. For voters in the district, voting may come down to popularity, Coolidge said. With platforms so similar, personal connections with constituents may be most likely to separate candidates from one another. And though Stewart’s perspective from outside the State House may be an advantage, Coolidge said the familiarity Friedman and Garballey have with constituents has probably given them each a leg up. Before working in the Legislature for nine years as Donnelly’s chief of staff, Friedman, 64, spent five years as a public school teacher and then 20 years as a manager at engineering and technology companies. She has served in the Arlington Town Meeting and co-founded the Arlington Education Foundation, among other local positions. Friedman said education is one of her campaign’s primary focuses, joining health care and the environment as issues voters seem most concerned about. “What I have found is that if you take away all the labels, people care about the same things . . . If we don’t start out with, ‘Well, I’m a Democrat and you’re a Republican,’ there’s a lot in common,” she said. Friedman has so far raised $64,639, the most of any candidate, according to reports published on the website of the state’s Office of Campaign and Political Finance. She described her relationship with Donnelly as a “perfect partnership” and said she wants to continue his legacy of being a fighter for change. Garballey, 32, has been a state representative for nine years, winning the post in a 2008 special election at the age of 23. His political career began in high school, when he was elected to the Arlington Town Meeting. When he was in college, he was elected to the Arlington School Committee. He continued prioritizing education in his role at the State House, serving as vice chair of the Joint Committee on Higher Education and sponsoring bills on higher education, including a proposal to establish college savings accounts for children born in Massachusetts. Garballey, who was adopted with his twin brother at age 2, said he wants to help the state’s “most vulnerable” residents by improving foster care policies and providing more resources for social workers. He hopes to reform the Department of Children and Families, which has faced criticism for the number of children who have died or been neglected in state custody. “For the Commonwealth to let any child that’s in our custody or care to pass away, like what happened with Jeremiah Oliver and other children in the Commonwealth, is morally reprehensible, and it’s not who we are as a Commonwealth,” he said. A Lexington Town Meeting member and former Lexington School Committee chair, Stewart, 59, has been a regular presence in her community and has devoted much of her career to improving the state’s education systems and access to arts programs in schools. “Being on the inside, knowing all the players, knowing all the people, that just sounds like you have all the answers and you’re not going to have room to listen, and I feel like I have margin around my thinking,” she said. Stewart has raised $13,538, $5,000 of which is a candidate loan, according to her campaign finance filings. Over the past several decades, Stewart has played the role of advocate and activist for many of the same priorities her opponents have emphasized, she said. But as a legislator, she said, she would hope to reinvent the way state leaders communicate with their constituents and challenge the norms. “Just because things were done a certain way for some years doesn’t mean it’s the right way or the best way,” she said.